Requiem, Op. 5 / H 75 composed by Hector Berlioz (1803-1869). Arranged by Philipp Scharwenka. Choir and piano. For tenor voice solo, SSTTBB choir, piano. This edition: Paperback. Liturgical, Original Works, Mass, Transcriptions, Choral. Romantic Period; Sacred/Hymns, French, Funerals. Large Vocal Score. 120 pages. Published by Serenissima (SA.19832).ISBN 9781932419832. Romantic Period; Sacred/Hymns, French, Funerals. 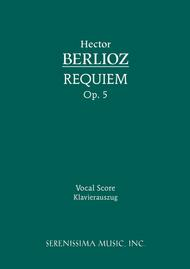 8.27 x 11.69 inches.Berlioz composed his Grand Messe des Morts, or Requiem, in 1837 for a huge orchestra with four brass choirs plus the usual vocal soli and chorus. The vocal score presented here was prepared by the Polish pianist and composer Philipp Scharwenka (1847-1917) to coincide with the issue of the full score issued as part of the Berlioz Complete Works published by Breitkopf & Hartel in the first decade of the 20th century. This digitally-enhanced reprint has been enlarged to a very readable A4 size with measure numbers added.